Conference Series Ltd invites all the participants across the globe to attend 9th Euro-Global Summit on Toxicology and Applied Pharmacology Paris, France. Anna Radominska-Pandya serves as a Professor in the Department of Biochemistry and Molecular Biology at UAMS, and she is the Editor in Chief for Drug Metabolism Review. She received her Ph.D. from the Institute of Biochemistry and Biophysics at the Polish Academy of Sciences in Warsaw, Poland. She has published 175 papers in various peer-reviewed journals, and she has received twelve R01 grants from the NIH and DoD. Her research interests include: the regulation and suppression of human UGTs and their role as anti-proliferative agents in cancer models, the interactions between UGTs and cannabinoid receptors, the delivery of UGT genes and drugs into cancer cells using nanomaterials, and the roles of UGTs in the biotransformation of drugs including resveratrols and drugs of abuse such as marijuana and synthetic cannabinoids. Statement of the Problem: The expression of CB1 and CB2 cannabinoid receptors (CBRs) was recently identified in a variety of cancers. In addition to normal forms, several receptor variants have been identified. It is recognized that CBRs activated by specific ligands effect cancer proliferation. Limited research reported that the function of the receptors is highly cancer specific. However, the information on the role of CB ligands in cancer is underdeveloped. 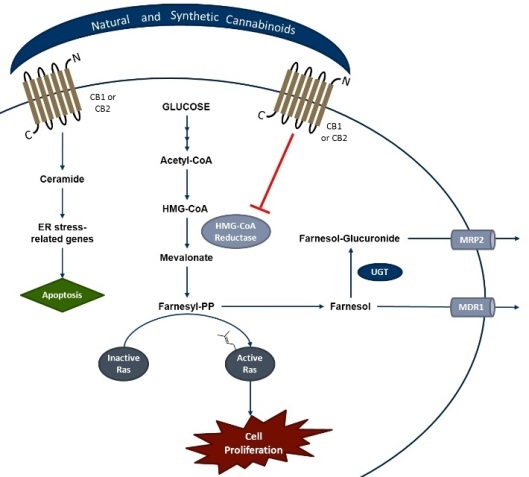 The purpose of this study is to identify CBRs in breast and pancreatic cancer cell lines, investigate the effects of CBR activation by specific synthetic and natural ligands, and reveal the role of CBR variants in breast and pancreatic cancer cell lines. Methodology & Theoretical Orientation: Breast and pancreas cancer cells were utilized to obtain cDNA, lysate, and membrane for Western blotting, siRNA treatment, and RT-PCR. The effect of several CB ligands on cell proliferation was investigated. Findings: All cancer cells expressed CB1 and CB2 mRNA and contained different levels of receptor proteins. In the case of CB1, significant amounts of dimers were formed. RT-PCR demonstrated that both CB1 and CB2, and several CB1 variant forms were present in cancer cells. Silencing of CB1 decreased the effect of CB1 ligands on proliferation. Conclusion & Significance: Our preliminary data clearly demonstrate that CB1 and CB2 receptors as well as several CB1 variants expressed in cancer cells can be activated by anti-cancer drugs and natural compounds. The type of cancer strongly determines how drug treatment will affect cancer cell proliferation, consistent with reports that CBRs are recognized as highly drugable targets in cancer cells. It is anticipated that this pathway can constitute a novel and effective means to treat cancer. Future studies will be designed to investigate potential CBR metabolic targets. Figure 1 presents metabolic pathways that can be affected by activation of cannabinoid receptors. (NIH/NIDA DA039143 to AR-P and PLP; Award W81XWH1110795 to AR-P). 1. Dates C R, Fahmi T, Pyrek S J, Yao-Borengasser A, Borowa-Mazgaj B, Bratton S M, Kadlubar S A, Mackenzie P I, Haun R S, Radominska-Pandya A (2015) Human UDP-glucuronosyltransferases: Effects of altered expression in breast and pancreatic cancer cell lines. Cancer Biol. & Ther. 16(5): 714-723. 2.Prather P L, Francisdevaraj F, Dates C, Greer A K, Bratton S M, Ford B M, Franks L N, Radominska-Pandya A (2013) CB1 and CB2 receptors are novel molecular targets for tamoxifen and 4OH-tamoxifen. Biochem. Biophys. Res. Commun. 441(2): 339-343. 3.Greer A K, Dates C R, Starlard-Davenport A, Edavana V K, Bratton S M, Dhakal I B, Finel M, Kadlubar S A, Radominska-Pandya A (2014) A potential role for human UDP-glucuronosyltransferase (UGT) 1A4 promoter SNPs in the pharmacogenomics of tamoxifen and its derivatives. Drug Metab. Dispos. 42(9): 1392-400. 4. Saeed L M, Mahmood M, Pyrek S J, Fahmi T, Xu Y, Mustafa T, Nima Z A, Bratton S M, Casciano D, Dervishi E, Radominska-Pandya A, Biris A S (2014) Single-walled carbon nanotube and graphene nano-delivery of gambogic acid increases its cytotoxicity in breast and pancreatic cancer cells. J. Appl. Toxicol. 34(11): 1188-1199. 5. Brents L K, Medina-Bolivar F, Seely K A, Nair V, Bratton S M, Nopo-Olazabal L, Patel R Y, Liu H, Doerksen R J, Prather P L, Radominska-Pandya A (2012) Natural prenylated resveratrol analogs arachidin-1 and -3 demonstrate improved glucuronidation profiles and have affinity for cannabinoid receptors. Xenobiotica. 42(2): 139-56. Christopher Busby is a Researcher in the health effects of ionizing radiation. He qualified in Chemical Physics at the Universities of London and Kent, and worked on the molecular physical chemistry of living cells for the Wellcome Foundation. He is the Scientific Secretary of the European Committee on Radiation Risk (ECRR) based in Brussels. He has held a number of honorary university positions, including Visiting Professor in the Faculty of Health of the University of Ulster. The biological consequences of exposures to internal radionuclides are currently modeled by estimating the integrated absorbed dose to organs in the body from specified intakes. Biological damage and health risk is then predicted from epidemiological studies of externally irradiated populations where absorbed dose is known or has been calculated. However, the approach does not distinguish between individually specific properties of radionuclides based upon their biochemical identities. This approach is equivalent to employing dose as mass (in grams) as a predictor of chemical toxicity irrespective of the pharmacological agent. The issue and its consequence is discussed in terms of theoretical, empirical and epidemiological indicators of the effects of internal exposures to anthropogenic radionuclide mixtures and a generalized risk coefficient for low level mixed Uranium fission-product exposures is deduced from genetic and heritable effects reported in Chernobyl contaminated territories. Application of this coefficient to global nuclear test fallout in the 1960s predicts effects on infant mortality and downstream health consequences in the fallout cohort which are currently emerging. The legal and philosophical implications will be briefly discussed.